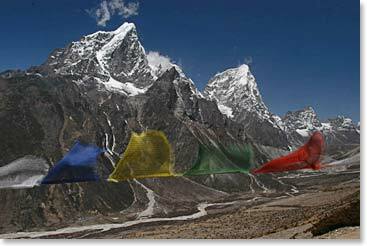 It is just about 5 pm on May 5th I am calling you from 16,100 feet at Lobuche, adjacent to the Khumbu glacier, not far from Everest base camp. The team is doing great. We all arrived here by 3:30 this afternoon. We walked from Pheriche extremely slowly to allow our bodies to adapt. 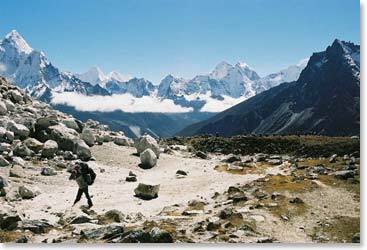 After we had lunch at Tukla at about 15,000ft, we walked slowly up the steep terminal moraine onto the Khumbu glacier. 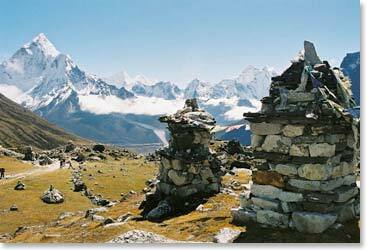 When we reached the top, we were at that spiritual, beautiful spot where the Sherpa Chortens/memorials have been built for years. 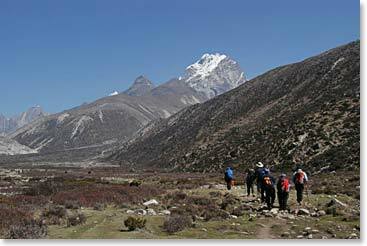 Our group took quite a lot of time there remembering our own lost loved ones, contemplating the power of the mountains above us, the history of Everest, the spirituality of the Sherpa people, and the beauty of the mountains all around us. There was only about a 45-minute to one-hour walk into our comfortable lodge here at Lobuche. The group is all inside having their afternoon tea. I am standing outside that lodge right now and I can report to you that it is really very cold here on the Khumbu glacier at this altitude. The team is doing great. 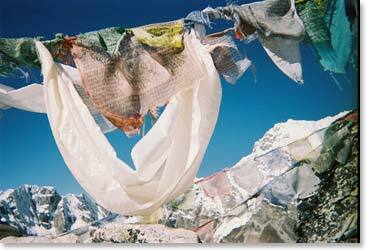 We are enjoying each step of the way as we climb higher and higher towards Everest base camp. 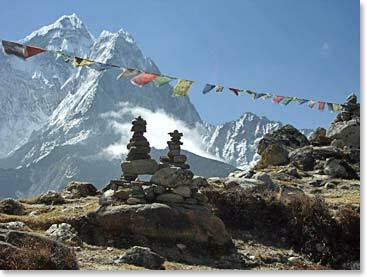 It is great to be together and great to be in this wonderful place called the Khumbu, in the shadow of mount Everest.